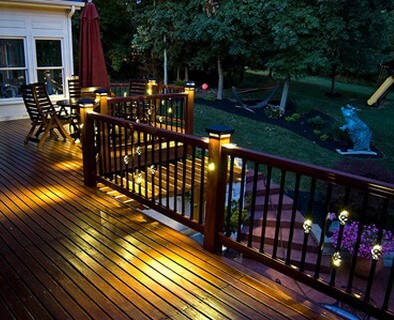 First and foremost, outdoor lighting adds safety to your property. A well-designed exterior lighting plan increases visibility around your home, along paths, sidewalks and stairs and in your yard, eliminating darkness and shadows. Investing in outdoor lighting certainly pays for itself in the long run and enables you to extend your outdoor activities well into the night. So, are you looking for an intermediate-level do-it-yourself project that will also enhance your exterior lighting plan in the process? Reward yourself – and your landscape – with decorative outdoor lighting. Survey your property to determine areas in need of illumination. Bring along a measuring tape and take measurements, especially to exterior power outlets. Look for dark spots and corners that might need lighting for safety reasons. Note hazardous steps or curbs that could use light. Make a sketch detailing landscape features and their location, such as the house, pathways, driveway, water features, gardens, trees, shrubs, garden art. Be sure to include each location of any outdoor electricity source. Decide which areas would benefit from solar light installation, keeping in mind these areas need no wiring. Choose the types of low-voltage lights you want in each area – downlights, backlights, uplights, and softlights (see below). Be sure to check your plan against local codes. You might need a permit before you begin work. Getting creative with your exterior lighting plan is as simple as choosing different light effects that pack a powerful visual punch. Downlighting directs light toward the ground and is used to create safe pathways and stairs. Backlighting directs light onto a wall or fence behind the desired subject to be highlighted and is used to feature trees, artwork or architectural enhancements of your house. Uplighting directs light up, illuminating the underside of a surface, and is used to feature address signs, statue, foliage or fountain. Soft lighting directs light in all directions for an atmospheric effect and is used to create mood, romance and ambiance. Low voltage halogen lights range from about 4-50 watts. The higher the wattage, the higher the level of brightness. Choose light fixtures first, then add up the wattage. You’ll need a power pack that supplies enough wattage for all lamps. It takes 110 volts. Divide a large lighting system into smaller ones if necessary, using a power pack or transformer for each. In addition, you’ll need cable and cable connectors to support the wattage. As mentioned earlier, solar lighting is all-inclusive. To install your lighting system, keep safety in mind at all times. Place the power pack within 1 foot of the outdoor electricity source – 110 volt standard US household current with a GFCI receptacle. Use a waterproof cover to protect the receptacle and plug-in. Do not install the power pack indoors. Attach the low voltage cable(s) and turn on the power pack. Always read power pack instructions. Lay the cable to your lighting fixtures according to your plan. Keep it above ground rather than burying it. You can use cable connectors to join two or more cables, or to change run direction. For runs of over 150 feet or if you’re using 10 or more lamps, use heavier cable. Attach the individual light fixtures to the cable with the power on. Make sure the fixtures produce light when connected. Follow the instructions provided with the light fixtures. Set the timer on the power pack to the ON/OFF times you desire. Do the lights come on? How do they look? Make adjustments by resetting the timer or moving lights around. After you’re satisfied with your decorative outdoor lighting design, bury the cable with dirt, mulch, sod or rocks. You can also hide it behind foliage. Now that you’ve installed your decorative outdoor lighting, you home and outdoor living spaces, landscape and gardens will feel inviting and magical. Summer nights are made for this! Come holiday time, consider switching out light bulbs for color and charm. By the way, you’ve also provided safety and security for your home. How practical of you! Our expert staff is always on hand to help you with gardening projects. From ladders and other equipment to event lighting and more, if you have any questions about what to choose, pricing or how-tos, don’t hesitate to contact us. Stop by our store — we’re open seven days a week.